Welcome parents and potential scouts. The adventure is about to begin. 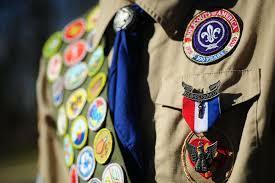 Thank you for selecting Troop 201 for your scouting experience. The troop committee and adult leadership are humbled by the trust and confidence you have placed with us. We will not let you down. Troop 201 strives to accomplish these goals through emphasis on "The ideals of scouting, the patrol method, outdoor experiences, rank advancements, associations with adult leaders, personal growth, leadership development and the uniform. We make sure our scouts also have more than a little fun along the way. Throughout your scouting experience, scouts and parents will have questions, concerns and a whole host of thoughts and emotions. Feel free to contact any of the leaders with your questions. All of us have been there with our own children and vividly remember that first weekend our young scout went off to camp for the weekend without us. Parental involvement is the key to a healthy troop. We encourage and welcome parents to get involved. Without your help, the program cannot continue to be a success. We try to provide as much helpful information as possible on this site and will provide weekly individualized newsletters to each scout and his parents to keep them informed about upcoming events. It all starts with an application. Please download an application in .pdf format from one of the links below. Adult applications are only needed for individuals interested in volunteering in a leadership position. We will contact you based on the information provided in the application within 72 hours.